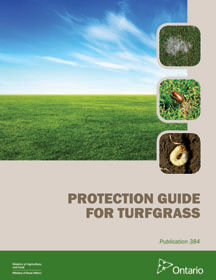 An updated version of the Protection Guide for Turfgrass, is now available on the OMAFRA website. This publication lists crop protection products registered for turfgrass as of December 1, 2014. A big part of managing turf is knowing which crop protection products to use. This publication is a great resource for sod farmers, golf course superintendents, lawn care operators and sports field managers. 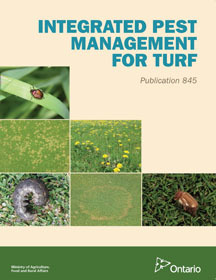 This publication, along with Integrated Pest Management for Turf, provides a complete reference package on turf IPM for Ontario. Obsolete pesticide collection – coming to Ontario this fall. The Pest Management Regulatory Agency (PMRA) recently announced the approval of a minor use label expansion for CALLISTO 480SC Herbicide (mesotrione) for control of labeled weeds on sod production turf in Canada. Callisto herbicide was already labeled for management of weeds on corn, mesotrione-tolerant soybeans, asparagus, cranberries and blueberries in Canada. The Pest Management Regulatory Agency (PMRA) recently announced the approval of a minor use label expansion for Chipco® Triton™ Fungicide (triticonazole) for control of summer patch disease on golf course turf in Canada. Triton fungicide was already labeled for management of several diseases on golf course turf in Canada.